The Koro Max is the “little brother” of the exceptionally popular Korinto machine from N & W. It offers the same range of delicious hot drinks albeit with a slightly smaller drinks capacity. 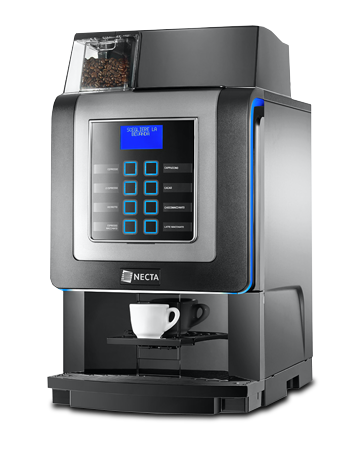 It is ideal for a small office environment where there is a demand for high quality bean to cup coffee and indulgent frothy hot chocolate. It is also suitable for bars, pubs and smaller restaurants. The Koro Max uses powdered or granulated milk rather than fresh milk. As with all of our machines of this type we always recommend using Milfresh 100% milk granules. This helps to create a cappuccino that is almost as good as one made with fresh milk. If the plumbed in version is used then a good quality water filter fitted to your mains is a must to avoid hard water problems. If the manually filled version is used then there is a small Brita water filter in the tank which needs to be changed regularly. Again this is to improve water quality and reduce limescale build up in the machine due to the hard water in and around London. We can supply the Koro Max across London and the surrounding areas such as Slough, High Wycombe, Watford and Reading. Our fully trained technical staff can provide you with a comprehensive technical back up. We stock all of the consumables that you will need for use in your Koro Max and our in-house delivery team ensure a speedy and efficient delivery service. The Koro Max is available on a purchase or rental basis. If you would like some advice on this or any of our extensive range of coffee machines please call the office and we can arrange for one of our experienced sales team to visit you in order to ascertain what is the right solution for you. We Supply and Install coffee and vending machines for rent, lease or purchase in the London, Buckinghamshire, Hertforshire, Bedfordshire areas. All the Home Counties. © 2018 London Coffee Machines. All Rights Reserved.